Toys. Little pieces of brightly colored plastic are overrunning my house. There are matchbox cars in the basement, a dollhouse in the living room, bouncy balls in the kitchen, games in the dining room, action figures in the bathroom, and blocks on the steps. When did this happen? How did we get to this point where we have four kids with enough toys to take over every single room (and hallway!) in our house? I go through a clean out of toys and de-clutter and de-toy every once in a while, but the movingness and carryingness of kids makes them suddenly re-appear as my children set up a restaurant hostess booth at our front door, a drive through in our living room bay window, and a library in our dining room. These kids move toys and STUFF around more than a colony of ants. But. Then I remember the function that all of these toys brings to my children. These plastic pieces, wooden blocks, and little figures are tools for learning and development. How do kids use basic toys in imagination, language development, social skills, fine motor strength, sensory integration, gross motor development, and problem solving? Toys are tools of function and help to develop a child's skills in so many areas. Grab a cup of coffee, move the ninja turtles from their couch battle scene, and read on! The Function of Play in Kids: Play is a child's work. In Occupational Therapy, probably one of the most asked questions is, "What is Occupational Therapy?" Since hanging up my graduation cap over 15 years ago, I've probably answered this question a few zillion times. Occupational Therapy is rehabilitation and treatment of activities of a person's daily living skills and occupations in order to improve function. A child's occupations are learning to get themsleves dressed, feeding themselves, and play, (among other things and depending on their age)! Whatever is important to a person, whether it be interests or to function throughout a day, is what an Occupational Therapist can work on in therapy services. "Play is a child's work." It's a phrase coined by Maria Montesorri, and a concept developed by Jean Piaget. Through play, children learn, develop, and integrate their systems and functional abilities. Today, I'm going to share how children can use those random toys scattered all over the house in development and learning. From infancy, play is a way of learning and developing skills. A baby reaches for a rattle and discovers that their arm can move intentionally. The sound, weight, and texture of a rattle integrates into the child's central nervous system and establishes neural pathways. This early sensory integration and every interaction with the environment helps to work on sensory processing in a child. As a child ages, they bounce, run, jump, and LOVE to play; their body seeks play. From 0-2, play is solitary. They are experiencing tastes, touch, sights, sounds, and smells. A one year old repeats the same play actions over and over again in play routines. Peek-a-boo and putting blocks into a basket over and over again helps the child to master physical and sensory skills. They develop problem solving, cause and effect, direction following, and a sense of self. Toddlers begin to imitate, pretend, and play with others. Pretend play encourages language, emotional exploration, and "job" scenes. Through pretend play, children build social skills. They can lead scenes, take turns, follow directions, explore empathy, gain more of a sense of self, build self-confidence, while working on tool use, clothing fasteners, and building and developing fine and gross motor skills. 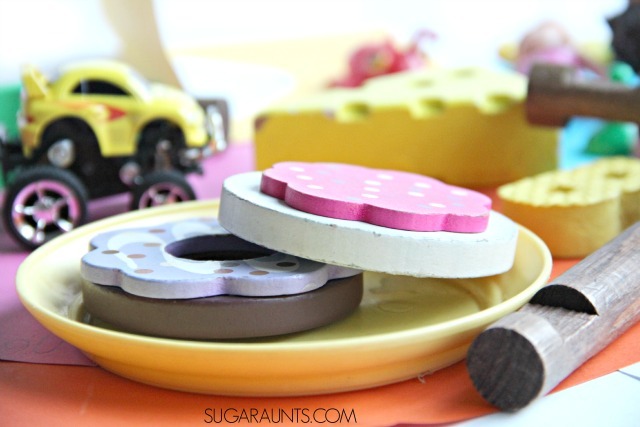 Toddlers explore their environment by walking an finding things, putting things into containers, rolling things, throwing things, turning pages, and examining the inside and outside of things. From 2 to 2.5, children observe others but do not play with them. Kids aged 2.5-3 play alongside other children, but not with them in social situations. Starting at 3, children often times begin to interact with others in their play. In Preschool aged children, kids play together with shared roles. They are curious and love to explore stories about animals and people. Crayons, paints, scissors, clay, sand, dirt, and other things are fun! Running, jumping, tumbling, rolling, and spinning provide movement and heavy work fun. They love to mix and feel how things are as they explore. Around three and four years old, imaginations begin to become awesome as they tell stories! School-aged children build cognitive skills in games as they problem solve, establish executive functions, share, build relationships, take part in winning/losing situations, and establish complex roles with other children. They are constructive with tools, projects, and toys. Play happens naturally. A child is led to perform instinctive physical milestones through play. A baby rolls over to reach that brightly colored shakey toy. A toddler pushes a car around the house while crawling on all fours, providing himself with vestibular and proprioceptive input and strengthening to the arms and neck. These play situations happen naturally and purposefully (even if the kiddo doesn't realize that his body is seeking out certain sensory situations!) Play should happen naturally, but there are ways to work on skill areas through play. 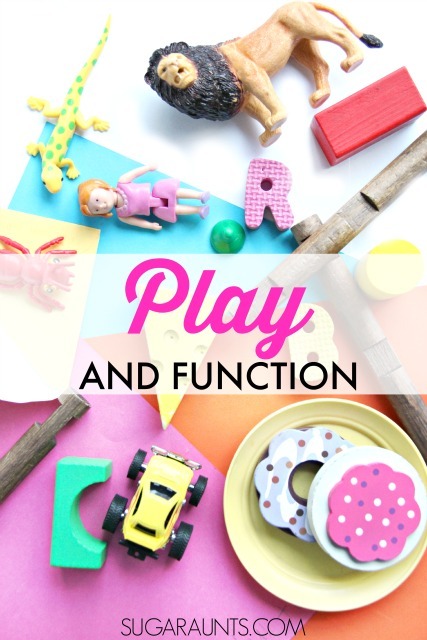 How can you build on natural play instincts with toys you already have in your house to work on developmental areas or Occupational Therapy goals? Use a child's interests to create pretend play situations. Model appropriate language or problem solving. Encourage imitation of actions using cars or action figures. Work on arm strength and shoulder girdle strength by pushing cars up a ramp. Provide proprioceptive situations by playing and building couch cushion forts for dolls. 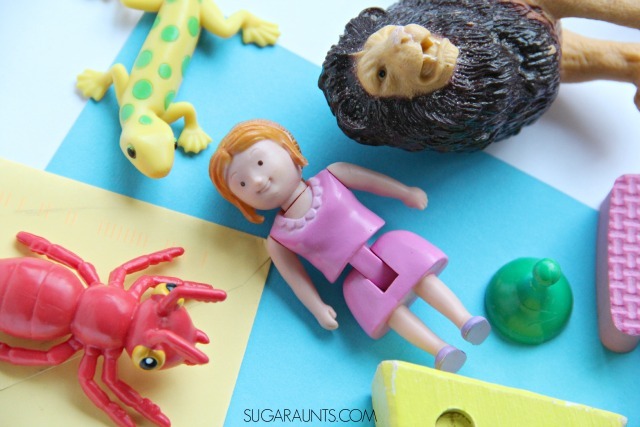 Respond to attempt to communicate in pretend play with animal figures. Allow your child to "lead" a play situation. 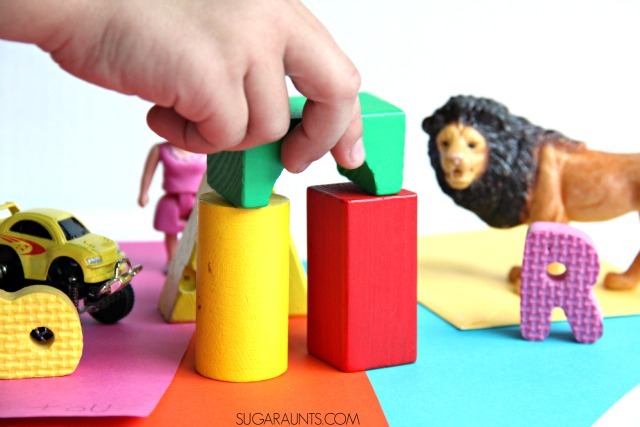 Encourage grasp development with toy manipulatives. Discus social interactions with small figures in small worlds, like this outdoors small world scene. Work on multi-step direction following in a pretend play situation where the bug needs to hop on the block, then go around the sticks, and get food from under the rock. What are your child's favorite play figures or imaginative toys? This post is part of my 31 Days of Occupational Therapy series where I'm sharing ways to work on common Occupational Therapy treatment areas using every day, free, or almost free materials. 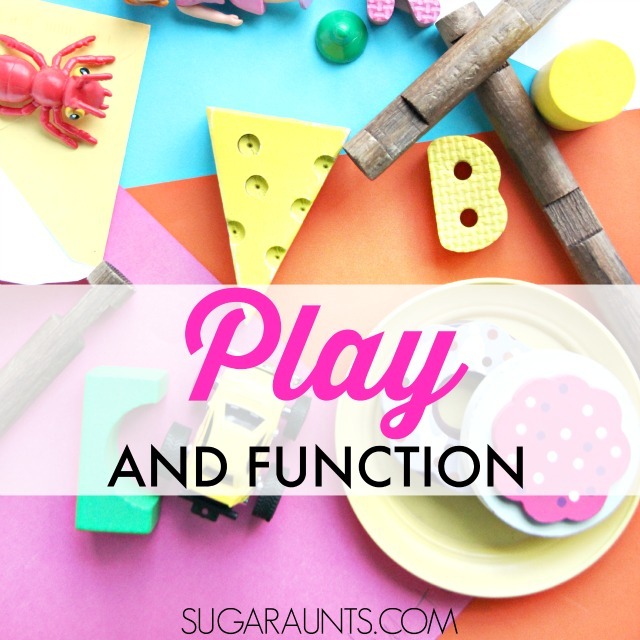 You will love some of these play and developmental ideas!